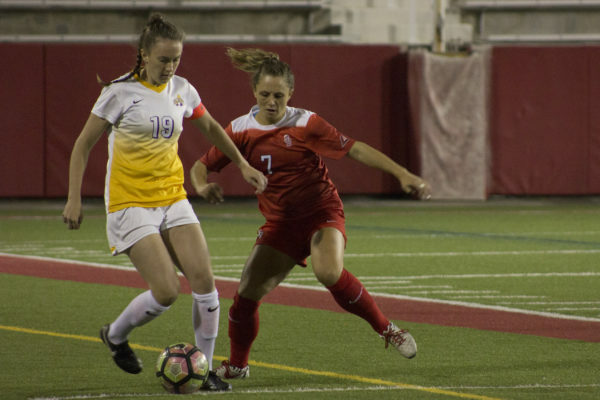 Stony Brook Women’s Soccer’s final match of the regular season against Vermont ended in a 2-0 loss to the Catamounts on Sunday afternoon at Virtue Field in Burlington. The Seawolves trailed all game after falling behind in the fourth minute of the match. Catamounts senior midfielder Sarah Martin curled a shot from the corner of the box that deflected off a Seawolves defender and found its way past freshman goalkeeper Sofia Manner to put Vermont up 1-0. Manner had four saves on the day. Vermont took further advantage of Stony Brook’s slow start before the half was over. Sophomore defender Christina Barry found the ball in the air off a corner kick from freshman midfielder Ella Bankert in the 31st minute, heading the ball into the net for the Catamounts’ second and final goal of the day. The Seawolves played aggressively after surrendering two scores in the opening half, tallying 12 shots to the Catamounts’ two in the last 45 minutes. Junior forward Julie Johnstonbaugh led the team with four shots. Although Stony Brook sent a flurry of balls flying goalward, the team was unable to find the back of the net on any of its attempts. After the match, Faherty praised his team’s effort in the second frame, but criticized their form in front of goal. The loss sets the Seawolves’ 2017 regular season record at 8-10 and 4-4 in conference action. Despite losing two straight matches to Vermont and Albany, Stony Brook managed to clinch a spot in the America East conference playoffs. The team will enter the tournament as a No. 5 seed, and are set to play its quarterfinal match on the road at No. 4 Hartford on Thursday, Oct. 26 at 6 p.m. Stony Brook beat Hartford in double overtime during their Oct. 1 regular-season match-up, winning on a golden goal from freshman forward Alyssa Francese in the 106th minute. Stony Brook was eliminated on penalty kicks in the last year’s quarterfinals matchup against Vermont after drawing level through regulation and extra time.